Seeing as it’s Halloween, I knew today’s oats had to be special. I carried this BF home in my bosom from the gym the other day when I spotted it in the free candy Halloween basket! And don’t worry, I literally used 2 pinches of crumbles. This oatmeal is still 90% healthy real food. 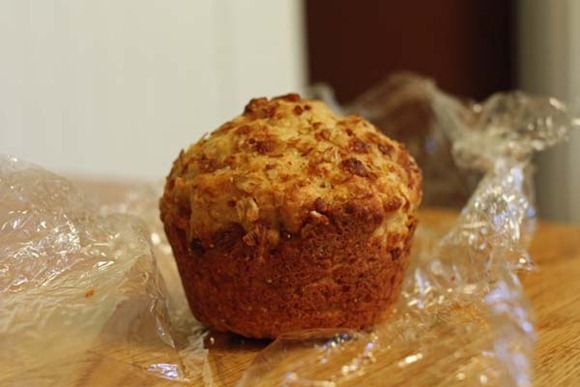 Also in the mix, a hunk off of Kate’s oatmeal muffin from yesterday’s picnic! After a few special requests in last night’s comments, here is my mom’s Pumpkin Chiffon Pie recipe! It’s so light and fluffy – can’t wait to eat some in a few weeks! 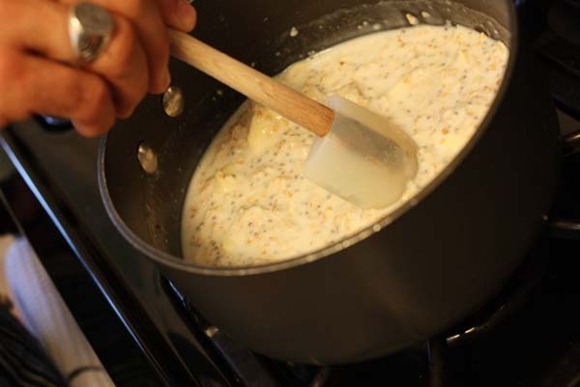 Combine first seven ingredients in saucepan. Stir in milk, egg yolks, and pumpkin. Cook and stir over medium heat until mixture boils and gelatin dissolves. Remove from heat and chill until partially set. Beat egg whites until stiff peaks from. Gradually add sugar and beat to stiff peaks. Fold gently into pumpkin mixture along with the whipped cream. Pile into crust. Chill. Notes: You can use any combination of the spices. Make sure you whip the whipped cream. that pie looks delicious, thanks for posting the recipe! wish I had thought to put candy in my oats today!! I love the oats in the leaves! Not worried at all, some of my best oatmeal creations are those with a little leftover cake, cookie, or candy! Thank you for posting the pie recipe! Thanks for your mom’s recipe! Great breakfast! I hope you have a great Halloween! 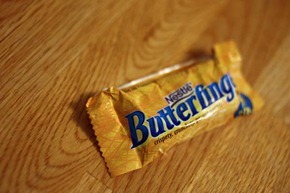 I love butterfingers! definitely my fave Halloween treat! Happy Halloween! You didn’t have to give the disclaimer, it’s okay to put a little candy in your oatmeal sometimes. Treat yourself. Ohh that pie looks great. 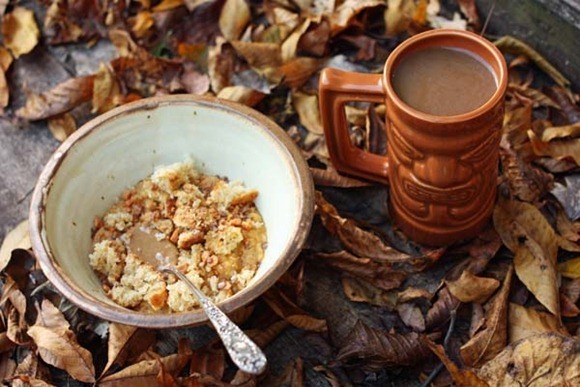 I love that you used Butterfinger crumbles- those and Reese’s were my favorite Halloween candies as a kid!! I bet those were good oats this morning, yum. That pie looks amazing. What a beautiful oatmeal! Love the fall leaves!! Oh that pie sounds amazing! I’m always looking for new ways make pumkin pie! 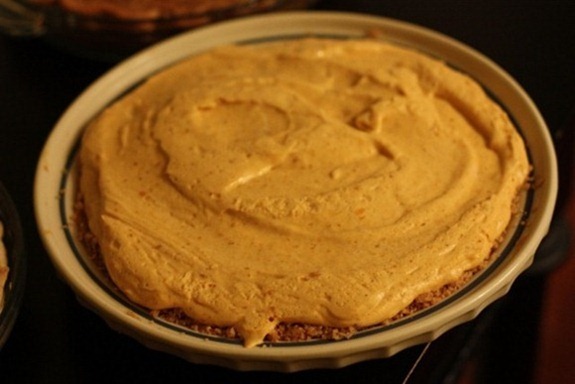 The pumpkin chiffon pie looks amazing — thanks for sharing! You are so creative with your oats, I love it! And your mom’s pie looks delicious and easy to make! YUM. 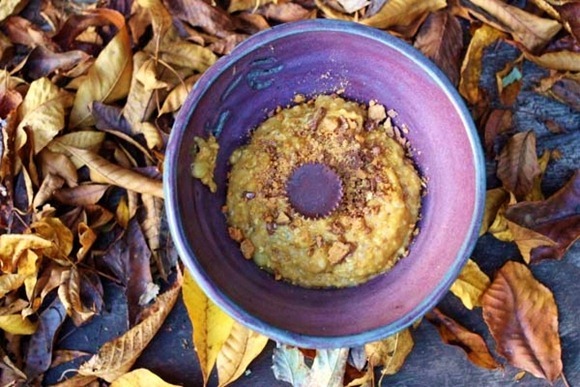 Halloweeen= candy topped oats…so cute! THANK YOU for the recipe 😀 yay! 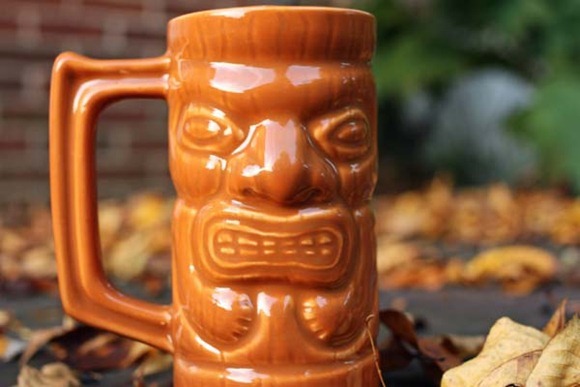 I have that Bora Bora mug and I absolutely adore it. Makes me smile. My husband just got the news that his lipids are elevated so I’m trying to get him to eat oatmeal – he hates it – can’t believe I married him ; ) In an effort to get him to eat “hidden” oatmeal, I just made your oatmeal pancakes. Delicious! I made the recipe with 1/2 cup quick oats and I blended them after measuring to make them less detectable with really good results. He didn’t care for the “hot bananas” but otherwise he thought they were really good. Next time we’ll try pumpkin or blueberries. This recipe provided 4, 1/3 cup batter pancakes – 2 each, but I couldn’t finish mine – stuffed! PS – Read that you have a friend named Andrea – I’ll go by Andy. From the title, I was expecting to see a fake finger in your oats. 😉 The pie looks really good! 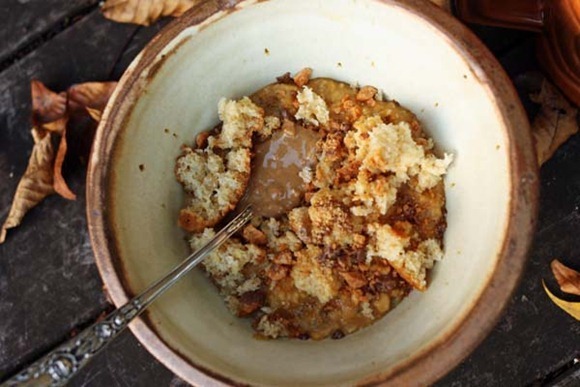 The pie recipe does sound super good–thanks for sharing!! 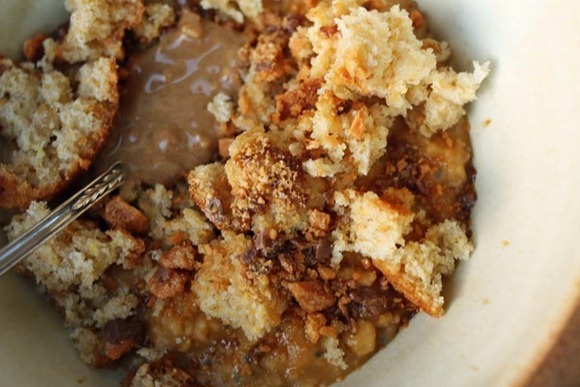 What’s Halloween oatmeal without some sweet toppings? Happy Halloween, Kath! 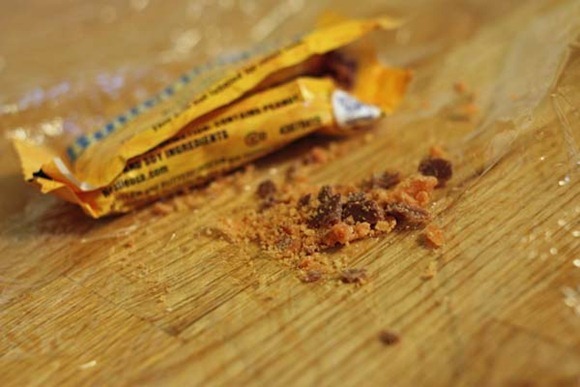 Eat the whole snack size Butterfinger Kath.. forget two pinches of crumbles..
Yeah, it wouldn’t have made it home from the gym if I had it in my sweaty little palm! I’m not a huge chocolate fan but I LOVE Butterfingers! 🙂 That pie looks AMAZING! Love the mug at the top of the page too…so fun! Have a great day! There’s nothing wrong with a little candy every now and then, especially on Halloween! 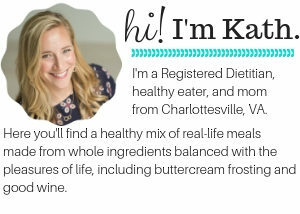 I certainly enjoy checking in with your blog but I do have to say that it bugs me a bit that you only put in a couple of pinches of the candy as if it becomes some major crime to “junk it up” once and a while…..Kath, your blog is clearly an example of healthy eating, you don’t need to justify or explain your food choices even when they stray from the norm. I agree with some of the other commenters…just eat it! You’re way too healthy and smart to be outdone by a candybar! UG, this sounds so negative but it’s, well….not….. anyway…HAPPY HALLOWEEN. Even if you did the whole fun sized candy bar (or two or three even! ), you wouldn’t need to clarify it still being real food. You eat so well that it’s no biggie to enjoy a favorite candy like that. And I hate to say it, but that might even be one of the things that come across as “disordered” to other readers, especially ones who don’t read regularly or are new to the blog. I’m NOT saying you are because I know you strive for and enjoy healthy foods, with still many quality treats and wine/beer/etc present. You do have balance and I never question your relationship with food. However, saying “don’t worry I only used a few pinches of crumbles” can give the connotation that using more is something shameful. I don’t believe for one second you intended it that way, but it is something to be cautious of. No, you wouldn’t have to eat more if you didn’t want more and only a pinch or two did it. But saying “don’t worry” gives it a different feel. I hope that makes sense and you don’t take offense to that. Hope you enjoy the rest of your Halloween! Thanks, Tina, for expressing this in a thoughtful, respectful way. Although I know Kath doesn’t intend for it to come across in such a way, it’s little notes like that that leave a sour taste in my mouth. Hoping there can be some respectful conversation about this. 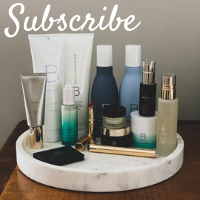 Um I love your blog but I don’t understand why you can’t have a little candy once in a while. It really isn’t going to kill you. Happy Halloween!! Looks really good! 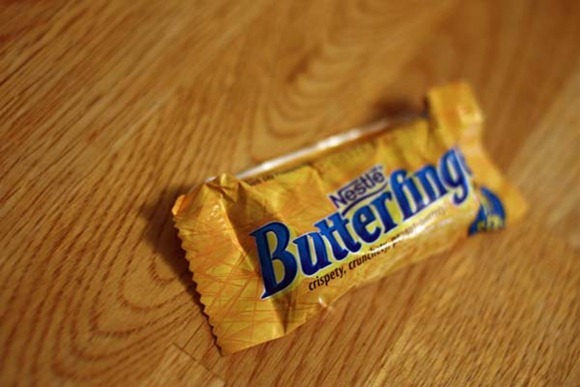 We’ve got Butterfingers here if anyone wants to come to Hillsborough for Halloween. i wish i had some candy around – all we have to hand out right now are tootsie pops and sugar daddies. not so good in oats! I love Matt’s bowl! Also, that chiffon pie looks droolingly delicious! Hmmm finger oats look great. Thanks for sharing the pie recipe, it does sound amazing. Happy Halloween to you too Kath! Oddly enough, we have the same candies in our bowl!! Fun oatmeal! 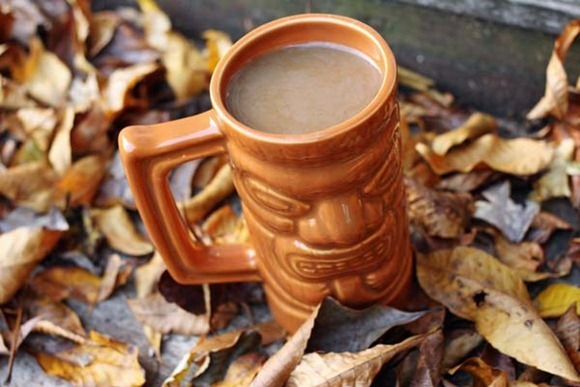 What a spooky mug…great way to greet us on Halloween Day. Thanks for the recipe, I’ve been bookmarking a lot of recipes for ideas on Thanksgiving potluck. 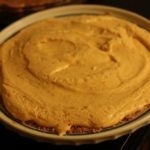 I love any and all kinds of pumpkin pie – I usually stick with traditional recipes, but this one looks great. 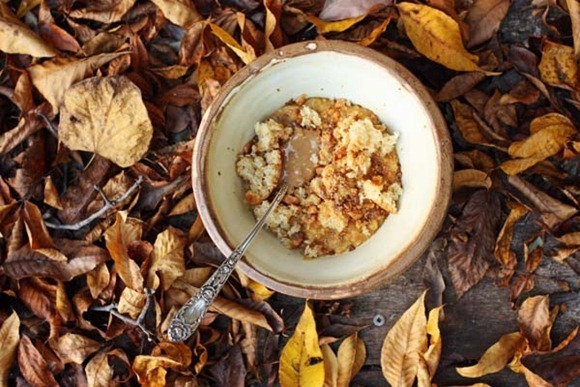 Love the idea of butterfingers in your oatmeal, I might have to do the same! I love your mom, Kath! Kath’s mom – you are the sweetest woman in the world! 🙂 I loveloveLOVE how motherly you are! I had the same thought for my Halloween breakfast! I had Greek yogurt w/pumpkin butter, dark choc chips, pecans, rolled oats, raisins, and crunchy cereal. Felt better than gobbling a snickers bar :-). Happy Halloween! 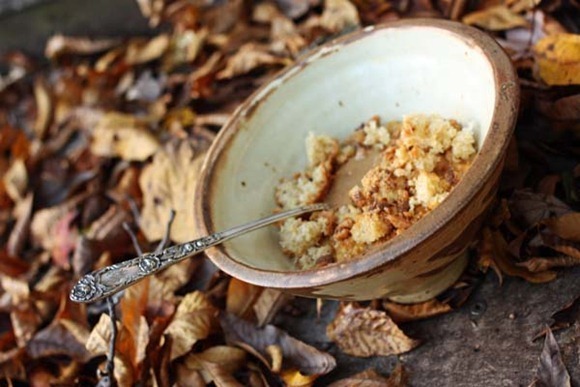 I really love the pictures of the oats in the crunchy leaves today! Your mom’s pie looks beautiful! Thanks for the recipe! Happy Halloween, Kath and Matt! That pie looks so good! Well, does the oatmeal as well! If Butterfinger is your favorite candy – why not have the whole thing, and then why say ‘don’t worry, I only had two pinches…’? I wonder how that will make people feel who have six times that amount of candy this year. It’s no worse for you then copious amounts of beer and wine. The reason I added “Don’t worry” was because of the backhanded comments I get about having “dessert for breakfast” every day. I really just can’t win. The pendulum swings back and forth, back and forth. I eat plenty of dessert, and I’m sure I’ll be having more candy with trick-or-treating tonight. I just didn’t want a whole candy bar for breakfast. If you read this blog regularly, you know very well that I am not afraid to eat sweets nor to I advocate restriction of anything. I know I tend to stick my nose into these conversations often, but I can’t help but to get irrate over them. I enjoy reading about all of your interesting (and healthy!) foods. Not one single person is the same nor do they eat the same. My identical twin and I love a great deal of the same foods but still have different cravings. I love that you can have sweets and indulgences in moderation because it shows that a little goes a long way. Plus, what the hell is wrong with having just a little bit of candy in the morning for fun without having to give yourself a sugar rush? You were smart because you knew you were planning on eating more later so you didn’t “spend” all of your calories and sugars in one meal. I think people need to lay off and just enjoy the creativity. I don’t know if it’s jealousy or just plain ignorance, but I’m tired of it. If you want to be mean, go find somewhere else on the internet. There are plenty of other websites and blogs. Please keep doing exactly what you are doing. You inspire me and countless others to just live life and don’t hold back. Because of you, I have been able to tap into my creativity more and be more relaxed with nutrition. I look forward to your blog everyday. Gosh, you don’t need to justify putting a treat on your candy! Go for it and enjoy; who cares what % “healthy” it is! It looks yummy and nourishing, and that’s all that matters! i love that you’ve used the leaves in your recent photographs. it’s so beautiful. jeez people are really critical on comments. Don’t worry about them, you are awesome!!!! so i made the pumpkin chiffon pie and it was delicious, but it definitely doesnt look as fluffy as that picture!!! : ( maybe i need more whipping cream!